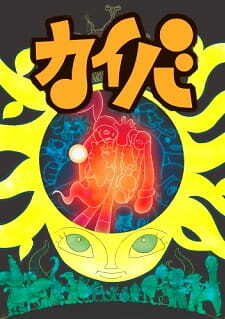 The series received an Excellence Prize for animation at the 2008 Japan Media Arts Festival. Kaiba is a story that begins with a young boy who possesses no memories, a locket with a blurry picture of a girl, and a hole in his chest. From there on, it dives into a complex look at what it means to live, speaking to its audience in eclectic ambient music, flat hues, simplified textures, and caricatured expressions. It is a story of heartache, rejection, and despair. It is a story of loss and of pain, and one that explores a world in which there is incalculable capacity for wrongdoing, cruelty, and evil. It is a story that hits its audience with difficult and complex moral problems, yet it offers very little in the way of solace or resolution for any of the questions it raises. It pulls no punches and promises no answers, and in doing so, retains a sense of honesty with its audience that few works of its nature posses. And yet, in spite of the horrors and sadness that the world of Kaiba is embroiled in and consumed with, the core cast of characters are simply ones who—similar to each and every one of the characters they meet on their journey—are struggling with the questions of how to be, and what it is that constitutes being. In a world where memories and forms are stolen, bartered, and sacrificed as easily as clothing or food, identity becomes even more fluid and fragile than it is in real life. Kaiba takes this theme and extrapolates it into a reality so twisted and surreal that its commentary is impossible to miss. Cinematically, Yuasa offers a unique directorial method of presentation that draws far more from Osamu Tezuka’s gekiga than from the prevailing influences of today’s directors. Yuasa’s adaption of Tezuka’s style goes beyond the obvious character model similarities (designed by Nobutaka Ito), infiltrating every nook and cranny of the narrative elements. A reverence for and homage to Tezuka’s method is present from settings and thematic scope down into the minutiae of presentation, particularly in shot compositions and depictions of action or psychoses that alternates between reserved detachment and unforgettable heart-pounding relevance. The surrealistic, futuristic depiction of the thematic emphasis on the relationship and nature of individuality, consciousness, memories, and flesh could be right at home in something like “Apollo’s Song”. The portrayals of intolerable human cruelty resultant from complex, struggling characters seem to spring right out of something like “Ode to Kirihito”. The heavy handed assault of dense symbols and exaggerated physical forms screams for a sense of old-school melodrama that much modern anime generally lacks—or often enough, when it IS present, it is rarely ever handled with the level of versatility and adroitness that Yuasa presents in Kaiba. But this is not to say that Yuasa is somehow “ripping off” Tezuka’s legendary works in any way—in fact, one need not even be the least bit familiar with Tezuka’s body of work in order to enjoy this program. What maintains Kaiba’s uniqueness is that, both in spite of and because of its use of Tezuka-esque elements, it ultimately offers an experience that is greater than the mere sum of its parts. The skill with which Yuasa manipulates his characters and paces his episodes bridges the gap between the work and the audience in a way few anime series achieve; although the first episode resembles more a dream than a traditional narrative, it doesn’t take long for emotional attachment to form around both the primary characters of the show (as they are sparingly revealed) and the secondary characters that pop up per episode and often disappear just as suddenly. Much of the program retains a quality akin to something of a vague hallucination even after completion, however its narrative remains traditional enough that things like characters, plot, back story, and development are all recognizable. What begins as a fever dream or a nightmare turns out to be a cerebral quest through amnesia, psychosis, revelation, doubt, and finally trust. Some of its mysteries are slowly unraveled explicitly, others are left to subtle allusions or drift wantonly in a haze of ambiguity. Development of the characters involved with the story of the protagonist alternates between exceptionally subtle and heavy-handed, though often times both ‘subtlety’ and ‘heavy-handed’ development occur simultaneously. It is most likely its themes and tone—outside of the visuals, of course—that will leave the heaviest mark upon its audience; Yuasa’s skill at sculpting atmosphere through imagery and sound is truly worthy of recognition. In short, Kaiba is not an easy series to watch. It is one that will present to its audience powerful images with powerful connotations that are not easily shaken off by the invested viewer. Its characters are memorable and complex. Its visuals, no doubt the most obvious thing to distinguish it from its peers, may give false first impressions or lend to it unjustified labels of pretentiousness. In the end, it is a work that is extremely difficult to describe in full, and one that is likely to affect each of its viewers in radically different ways. Recommended for fans of abstract cinema, surrealism, science fiction, Osamu Tezuka, other Yuasa works, or simply anyone looking for a short cerebral series that is nigh indescribable. People always try to be above others. It's because they can't be happy unless they have people below them. This show creates a whole universe around this concept and other unconventional ideals. From the anime description and genre choices for this show, and even the database picture the normal anime viewer might be a little turned off from this show. At first glance for me I quickly turned it away as I thought it was aimed toward children. Despite showing an R+ rating I also notice ratings are usually 20% correct in the MAL database. But after pushing it aside for about two weeks, I finally decided to give it a shot and boy will you be surprised. Right off the start, you're heart will start racing as you follow the story of the main character. A after waking up from a daze, blade runner 'esque chase quickly follows. After the action, the main character appears to be very lost, which I'm sure most of you will feel the same way he does. This also starts a unique connection and experience between the viewer and the main character. This is where the show really starts. One thing I'm sure most people will notice is the art style. You will either love it or hate it but don't let the artwork turn you away from this show. After an episode or two you will most likely appreciate the level of originality this art style brings to the plate. After i have seen over 100+ series in a three month span, this was a very welcome change to the orthodox anime styles. Dont let the simple look fool you as well, there are more than enough small details to pay attention to throughout. From the tiny memory pellets to an overcrowded storage room. Everything looks very thought out and amazing. Often you'll probably think to yourself, how the hell does Misaaki and Nobutaka make this ***t up? Another false assumption was that the characters were mostly children since they have a simple child like look to them. But they are very much mature adults. The characters are are all so very likable and I owe a lot of that to the art style and the small details that they do or don't leave out. The even greater point is how Masaaki Yuasa goes to great depths to control the viewers emotions with the use of these characters. One minute, you'll hate a character, then the next you'll feel sorry for them, then you'll feel frustrated because this is almost an emotional roller coaster. Rest assured, this is a good kind of frustration (if there is such a thing). Defintiely &quot;don't judge this book by its cover.&quot; This point of view story was rather an interesting one and the science, technology, and hierarchy surrounding this universe was very captivating experience. There are quite a large number of allusions and ideals in every episode that got me reflecting on what I have just experienced (which I absolutely love). I can't really compare this to any other anime show. If i had to compare the story to something, it like a telling of a blade runner/ matrix story in the eyes of Dr. Seuss. &quot;You hush your mouth!&quot; Howled the Mighty King Yertle. &quot;You have no right to talk to the world's highest turtle. &quot;I rule from the clouds, over land, over sea! Kaiba is a dystopian/cyberpunk anime. The atypical story telling and mesmerizing dystopias which are always complemented with vivid and unique artwork of the highest degree make for a highly enjoyable experience for myself. By no means do I consider these to be flawless genres but the amalgamation of the many tropes from these genres creates a captivating experience I personally can’t really find in other genre(s), so on that fact this review may be a little bias. One could argue that Kaiba itself is not a cyberpunk series but a dystopian fantasy and I could agree with that, and maybe that is why I consider it a cut above the rest of the cyberpunk (GitS and Texhnolyze for instance) I've watched. It is something fresh and has a totally different approach and perspective. However I do still feel it does share many similarities that cyberpunk does, so I will still refer to it as such. Like any other cyberpunk and dystopian anime it is apparent from the inception that it is a society that has been totally dehumanized. In this case, to handheld chips and yellow blobs. Bodies are thrown away like old clothing and replaced on mere whims. Human life and emotion is "seemingly" disregarded. Which is generally the most common criticism, and maybe even point, of these genres. They lack any real empathy and it is understandable that this can deter viewers from the genre. However, this is where Kaiba truly shines. Kaiba puts the futuristic technology into a more human context and is the reason why I emphasize the word seemingly. It is an empathetic cyberpunk, that is to say, that characters express true emotions and warmth. Which is something these series generally lack (for better or for worse? that’s each person's decision). It shows this empathy whilst at the same time, it is able to show the total loss of human value. To be able to show both polar opposites of this spectrum without one impacting the other is a true testament to how well done this series is. The empathy is shown in many cases throughout the series, such as maternal bonds, but most notably through the two main characters that, despite not remembering each other, and being in totally different bodies, they are still drawn together and attracted to one another. It also shows the sacrifices one is willing to take to stay with their loved ones and no amount of deceit and lies will stand between characters coming together. And at heart, this really is a series about human longing and romance. Similarly, the OST completely compliments and helps illustrate both the dystopian nature of the world in which Kaiba is set and also its warm empathetic side. Most notably two pieces: the Melody of Clonico and The Tree Song. The Melody of Clonico (episode 3) really serves to illustrate the empathetic side of the series. The Tree Song holds magnificent symbolism in both a literal and metaphorical sense, and it is no surprise why this song is teased throughout the entire series becoming its ‘staple’ piece. While this may not be relevant to some, it is something I can wholeheartedly appreciate. This song illustrates the entire series as a whole in more than one way. Kaiba's characters are fantastic for the most part. A large portion of the series can be considered episodic, meaning, Kaiba travels from one place to another and in doing so meets characters along the way that don't stay relevant for very long but they do what's required of them and are well developed enough in most cases that you genuinely care about them and what happens to them. Kaiba is a very interesting and mysterious character that at the beginning, the viewer knows as much (or as little) as Kaiba himself, who has lost his memories. As the series progresses Kaiba - and the viewer - learn more about his past which made it a very engaging experience as he slowly becomes more aware of the girl in his locket. That girl being Neiro. Neiro is also a very interesting character, who, without spoiling much, has issues of her own in regards to her memories. The most rewarding thing about the characters, namely Kaiba - but also others - is that his genuine interactions with other characters within the series brings a sense of warmth to an otherwise, overly cold and dark society. The art is a love or hate relationship. It is far from mainstream and maybe even pretentious. There's not much to say about that, the animation is still fluid, the characters are still well designed and the world they find themselves in is equally well designed. I personally found it to be one of the series greatest strengths and made it an even more rewarding watch. Kaiba is a bag of mixed emotions, on one hand it is incredibly sad to watch as human life is literally thrown away and treated like garbage, but on the other hand it is beautifully warm to see individuals stop at nothing to preserve this life and connect with their loved ones. It left me not knowing what to feel at times and I can only say that as absolute praise for the series. I am not saying this series is for everyone, it is totally understandable that if you’re not a fan of cyberpunk/dystopian anime this may not be for you, but if you don’t like these genres for the lack of empathy they portray, this may pleasantly surprise you. There are other reasons why this isn't for everyone, most notably, its art which as I said, is far from the mainstream. It may not be an easy watch for some, especially given the cyberpunk/dystopian tropes it has, but it is something I loved wholeheartedly. Where there is a body, there is a mind. A mind that is unquestionably a part of us and remains to be this way until our eventual passing. Throughout the centuries of philosophy and science, it is one of the most utterly fascinating aspects of human existence that has yet to be explored fully. There have been many stories that have delved into the realm of consciousness as the primary plot device from the mid-20th-century science fiction authors, and anime has had its fair share of shows that are akin to this. One of which is Kaiba, a fascinating trip that shows no boundaries of animation and how it can use different styles in anime that have primarily been redundant at the time. It is true that this type of story has not been done before. One that deals with the concept of minds and how it's our self, but with Kaiba, it's like a journey you go through with our main hero, named Kaiba. He meets different characters from his trip that all have distinct characteristics that make them stick out from the rest, who may or may not help him in his search to find his memories that have been lost after his long slumber. As we follow our likable hero, we discover how the world that Kaiba inhabits has begun to crumble under its dystopia. Although they portray the setting in a surrealist manner to give it a distinctive look, there's still the lack of any depth to the world itself. In other words, there's not enough to go around from the lack of exposition it gives to the history of this world that Kaiba has to offer, and it only succeeds halfheartedly. With that said, even though the plot features some mind-bending, philosophical facets that incorporate Kaiba, the story-telling that helps guide them through the narrative is somewhat lacking. Nonetheless, when the show starts, it manages to make an excellent first impression in showing us first-hand what the world is like and how the other people who live in it go through the absolute turmoil that plagues their way of life. Some moments were even strong enough to invoke tears from my eyes. However, it doesn't take long until we cut away from the protagonist and then start going into the character back story of another named Chroniko. To explain this clearly, Kaiba implants his memories into Chroniko, and from then on we get to explore Chroniko's past and how she was brought up into the world. While this might seem admirable to make us know that there are, in fact, more than just Kaiba that might matter, I feel as though it wasn't even needed in the first place when we already have to follow Kaiba and his journey to get his memories back, even though technically he's inside of Chroniko in these scenes. Furthermore, we follow other characters such as the sheriff, named Vanilla, and his fascination with Chroniko, or in this case, the body that Kaiba inhabits. This plays off more like a desperate attempt to make the show longer. After that, we discourage entirely that whole moment that involved both of those characters, and we follow Kaiba like nothing ever happened previously. One could say that those plot arcs were necessary for Kaiba to understand the meaning of human emotion and the human condition, but it comes across as a bit trite and forgettable once the next episode rolls in. Although with that said, the conclusion to the story felt incredibly fulfilling to experience after a brilliant romantic setup between Kaiba and Neiro, who play off each other very well. Their immediate feelings for each other might seem a little cliched, but how they direct the dialogue they say to each other comes off rather fluently and feels genuine. Right near the very last frame of the previous episode, it felt like the best way to give Kaiba a sense of closure. By far the most alluring aspect of Kaiba that has made it somewhat of an indistinguishable show amongst the anime community is the art and animation. Directed by Masaaki Yuasa, who also directed the classic The Tatami Galaxy and directed the animation and wrote the surrealist film Cat Soup, this man knows his way of transforming his visions into reality and making us clamor for more of his artistic creativity. Kaiba's hook from its animation relies not just on an unconventional art style, but also its seamless implementation to the story and tone it tries to convey to us. Once we see the art style which Yuasa executes on constructing Kaiba's world, the result is no less than jaw-dropping. In some areas, it might seem even a little forceful in the attempts of making things a little too wacky and cartoony, the moments where it shows how people can invade someone's memories look incredible at face value. The fluid motions that the characters exhibit in the show's animation feel reminiscent of western-influence and the works of the great Osamu Tezuka. The abstract shapes of the buildings and vehicles give the show its unique identity and ultimately becomes very memorable in that aspect. There is about as much creativity as one could get from a studio named Madhouse, who's no stranger to producing shows similar in nature of Kaiba. On the overall quality of the sound production, the voice acting is serviceable with the veteran voice actresses Romi Park and Mamiko Noto giving out terrific performances. Even with the limited amount of dialogue that the character Kaiba has throughout the story, Houko Kuwashima plays out the amnesiac archetype rather convincingly. Her voice emotes perfectly as an unemotional character who has lost all sense of meaning in his life because of how memories play a huge role to him and how that was perpetually lost. One thing to note in music is the opening song for Kaiba which is composed quite beautifully from the sublime electronic ambiance mixed with subtle orchestration. On top of that is the beautiful voice of Seira Kagami, giving a dazzling performance that sets a tone of pure melancholic loneliness, one of the main themes of the entirety of Kaiba. There's nothing quite like Kaiba's style and finesse to be found in most anime shows. I say style as in the animation, which is the only significant aspect of the show that makes it worth watching, but that's not to say that the story is terrible by any means. There's more to be seen in Kaiba than just the art and animation; but if it was only focused a little more tightly and given more world-building for it to be memorable, this would've been ranked higher. There is no doubt people will be looking at the art style and start thinking it's nothing like anime they're used to and reject it immediately. Distinctive qualities are a rarity these days, and I'm perfectly fine with this. No doubt we need more creative measures put into the medium, but when one show comes out in that one particular season that puts a lot of effort into its aesthetic qualities that challenge the norm, then that makes that one show all the more special.